From your base, tap the button at the bottom of the screen, then tap the demon icon. 1. The button at the bottom of the screen in your base will flash when Castle Crisis begins. 2. The event button will turn gray after Castle Crisis ends. Castle Crisis will enter cooldown and you can view the time left before it begins again. During this time, you can still enter the event page to view the rankings and other information. 3. The event will last for a maximum of 30 days. After 30 days, the event will end and cooldown will begin, even if the enemy was not defeated. 4. Each time the event ends, there will be a cooldown of 7 days. 5. Everyone on the server can take part in this event. All results will be displayed on the rankings, which are updated every 3 hours. 6. The event consists of 3 normal stages and 1 final stage. Each normal stage is guarded by an evil enemy, and you must defeat all three to challenge the final stage guarded by the Archdemon. Each stage has its own rewards. ①Ember Army Stage: Use defensive buildings and up to six Heroes to defend from the invading enemies! Defeating enemies will net you DMG Points. The stage is cleared when the server’s progress reaches 100%. Clear the stage to receive the stage’s rewards. 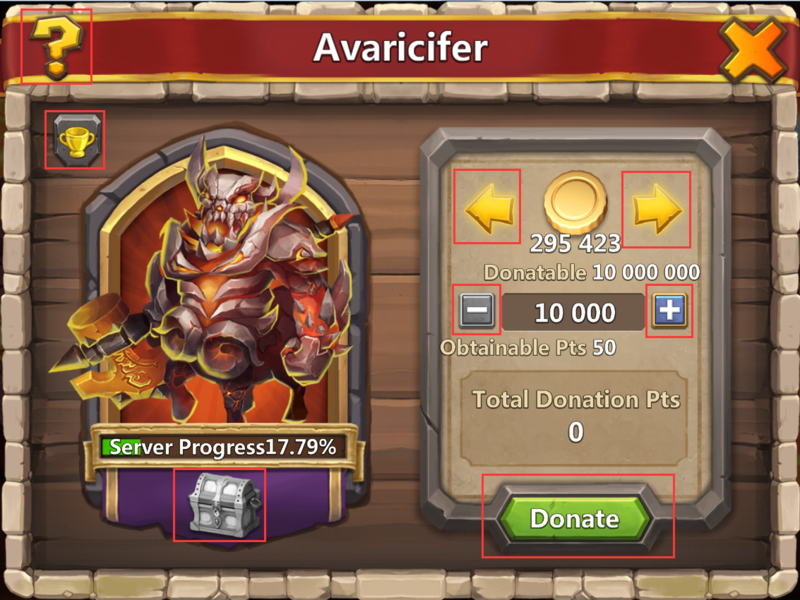 ②Avaricifer Stage: Donate to the greedy fiend! Everyone on the server has to donate the specified items to earn Donation Points. The stage is cleared when the server’s progress reaches 100%. Clear the stage to receive the stage’s rewards. ③Impster Stage: Overcome the tricky puzzles set by the cunning imp! Solving the problems will net you points. The stage is cleared when the server’s progress reaches 100%. Clear the stage to receive the stage’s rewards. ④Archdemon Stage: Defeat the Archdemon to end the crisis for the world of Castle Clash! Once defeated, the event ends and enters cooldown. Clear the stage to receive the stage’s rewards. The question mark is the help icon. 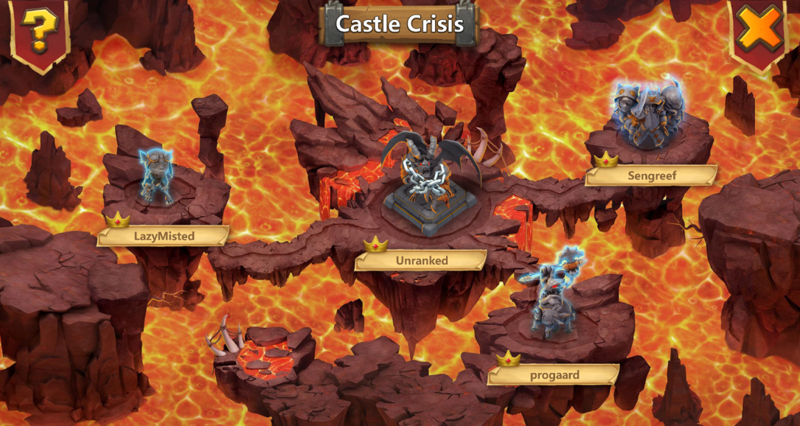 Tap it to view the Castle Crisis event description. The four statues on the page represents the four stages of Castle Crisis. Tap them to enter the corresponding stage. Question mark button: Tap to view stage description and rewards by rankings. Trophy button: Tap to view the rankings for this stage. Treasure chest button: Tap to collect your stage rewards when server progress reaches 100%. 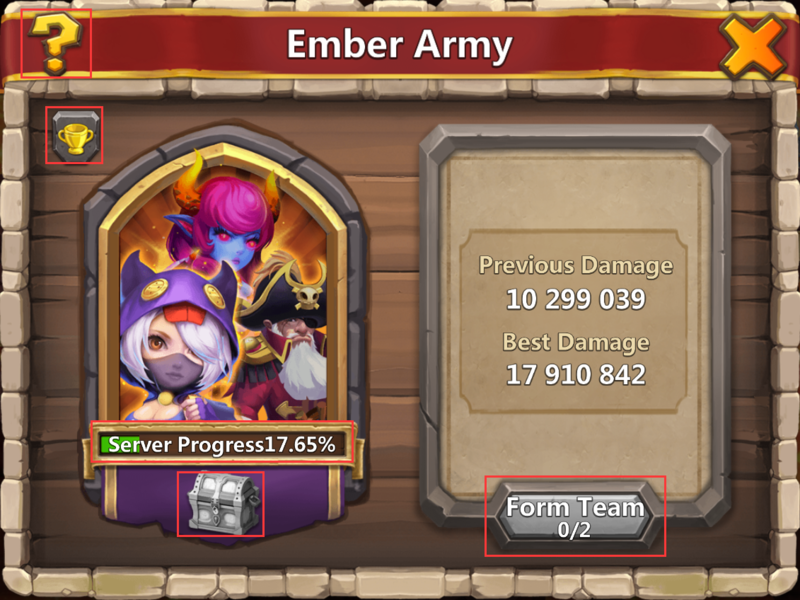 Edit Team button: Tap to design your base layout against the Ember Army. 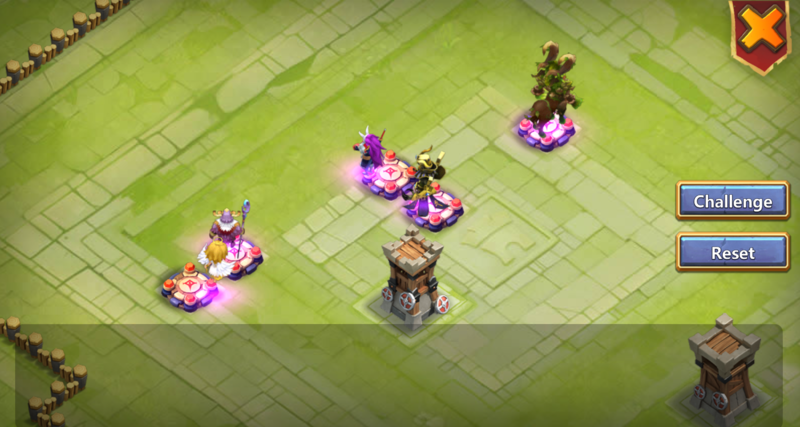 1) The game will register the information of your Towers, Hero Bases, Traps, Walls, and Hero Totems in your base. 2) Arrange your buildings and form a good base layout to defend against the invading Ember Army. 3) Tap Challenge to begin. Waves of the Ember Army will keep coming your way, so do your best to defeat more enemies and score high DMG Points. 4) When all of your Heroes are defeated and all buildings are destroyed, the battle will end and the battle report will appear. 5) You get two daily chances to challenge the stage during the event. Question mark button: Tap to view stage description and rewards by ranking. 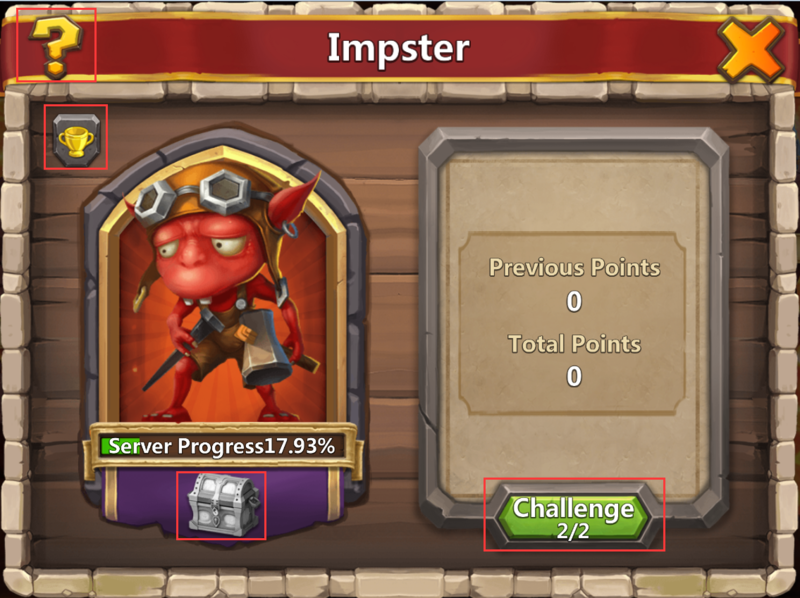 Challenge button: Tap to challenge the Impster. You get two daily chances to challenge the stage during the event. Each challenge allows you to draw 5 cards. Each card you draw will trigger one of four mini-games: “Cards of Fate”, “Trial of Luck”, “Match the Skill”, and “True or False”. Donate Gold, Mana, Hero Shards, or Honor Badges to gain Donation Points. Tap the left or right arrows to select the type of resource to donate. Tap “+” or ”-” to select the amount of resource to donate. Tap “Donate” to complete the donation. The Archdemon stage will unlock when the Ember Army, Avaricifer, and Impster stages are all cleared. Tap the Archdemon statue to access the Archdemon stage. Question Mark button: Tap to view stage descriptions and rewards by ranking. Exclamation mark button: Tap to view the Archdemon’s detailed skill description. Edit Team button: Tap to select your Hero lineup. 1) You can form your team with six Heroes. Tap “Start” to challenge the Archdemon. 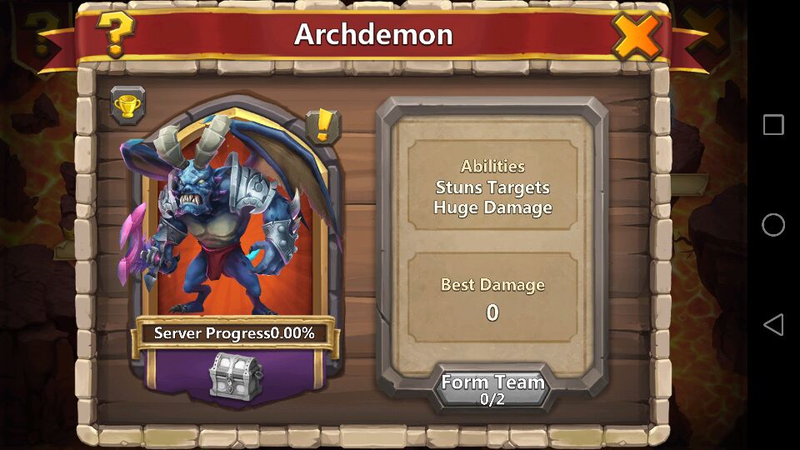 2) Abilities: The Archdemon will have two random abilities. Tap the exclamation mark for more details. 3) Best Damage: This displays the highest amount of damage you have dealt to the Archdemon in a single attempt. Merit Packs will be sent to your Warehouse as rewards based on your stage ranking. Check in-game to view the number of Merit Packs obtainable by rank. Crest Trunks, Crest Boxes, and Crest Bags will be sent to your Warehouse as rewards based on your stage ranking. Check in-game to view the number of items obtainable by rank. You’ll get a different number of Lucky Chests based on your stage ranking. Check in-game to view the number of Lucky Chests obtainable by rank. A Lucky Chest contains 1,000 Honor Badges and a rare item. Fame Boxes will be sent to your Warehouse as rewards based on your stage ranking. Check in-game to view the number of Fame Boxes obtainable by rank. When i complete 3 normal stage i cant do Archdemon Stage. Anyone tell me when i can do? You must forget the server progress. We all could only be able to challenge Archdemon once all these 3 bosses are beaten. Tks. And how long we can do Archdemon stage? Until he's killed. IMO it takes 2-3 days. Thanks, and u r welcome. The donation stage is bs! 600 shards and hb, for a few crests. Not to mention there are no resources in game anymore. Thank you admin leon for this valuable information about event. No problem and my pleasure! We can do Archdemon Stage right away after three stages 100%. Is IGG going to increase gold rewards to compensate for the drain caused by the donations? Yea!!!! No one has resources anymore!!! ^No it's finally fun and raiding has value! IGG you ruined CC... Im not wasting 200k+ in magic to raid 15k of gold. Wtf? Fix this lame-azz mode. That's why it's called CRISIS, IGG really meant it LOL. Now I cannot Evo my heros, I need 5M GOOOOOLD! Comment There are 12 more comments, click here to view them. the game mode has made raiding for resources more of a challenge. Not destroyed anything..
^Olaf^ I'm with him raiding is so much better now. Raiding is the heart and core of the game, and now it has value. yeah but how often do you really want to do it?